The City Farm shop is undergoing a small change that we think will assist customers in making their choices. Many of our plants are small and have yet to flower, so on the display tables we are attaching photographs of the mature plants in flower. Of course, help from staff is always available! At this time of year, many of our lovely native wildflowers begin to make their appearance. Although wildflowers can be seen throughout the year, late winter to early spring, before it gets too hot. This is the most spectacular time, so now is the time to get out in the bush that surrounds us. The heaths abound with their white flowers, boronias provide ranges of pink, hoveas have purple pea blossoms, hakeas and some wattles give the cream touches and then there are the various ‘eggs and bacon’ bushes whose prolific yellow flowers are easily spotted. In the wetter areas you may spot delicate vanilla lilies or milkmaids. 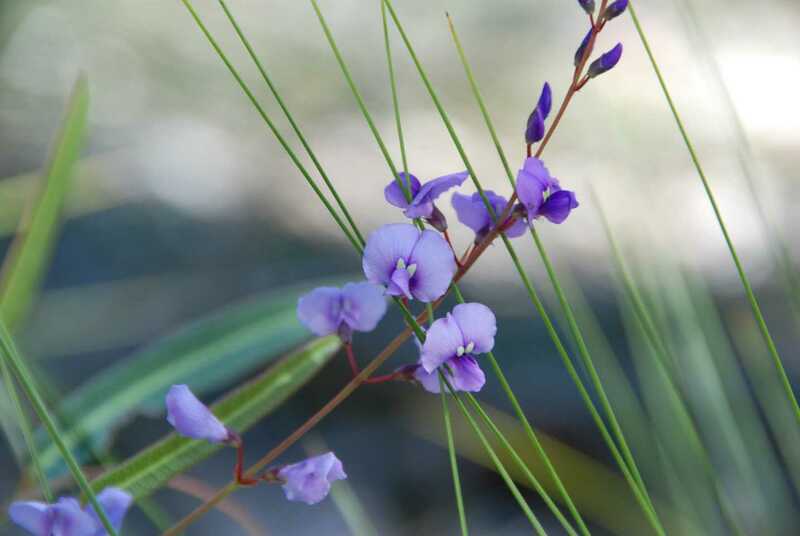 Our plant of the month is the spring flowering Hardenbergia violacea species, also known as Native Sarsaparilla. 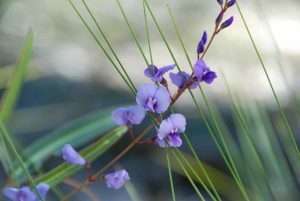 This is an erect or prostrate vine with trailing purple pea flowers, dark green lance-like leaves and oblong fruit pods. Plus an open day for City Farm!